Password Help is the password recovery system that gives you the ability to reset your myGate or Network (MSUNET2K) password without having to call the Service Desk. Once you know your network password, we recommend that you enroll in the Password Help password recovery system. NOTE: As of March 2019, Password Help no longer supports secret questions. You will need to use SMS/text messaging for password recovery. Go to the myGate login page. Click on "Forgotten Password?" as shown below. This will open the Password Help enrollment page. Enter your Network password (For help, view our Network Password article). Click "continue". You can now enroll your mobile phone number in Password Help. This will allow you to receive SMS messages* that will assist you in password recovery. From the dropdown boxes, select your country and your mobile carrier. Please note that not all mobile carriers are available to use with this system. Enter your mobile phone number, and click "Send SMS verification code." Allow approximately 15 seconds for your device to receive the SMS message with the 4-digit code. Enter that code into the bottom box in Password Help, and click "continue." After you have successfully enrolled in Password Help, you can log back in to update your myGate and/or Network password, update your mobile phone number, and view information about your Password Help account. If at anytime you forget your myGate or Network password, or are locked out of your myGate account, just use the "Forgotten Password?" link on the myGate login page. You will be able to log in to Password Help to reset your password by SMS*. For further help, call the Service Desk at 270-809-2346m Monday-Friday, 8am-4:30pm, Central. Check out this knowledge base article I found in the Murray State University knowledge base. 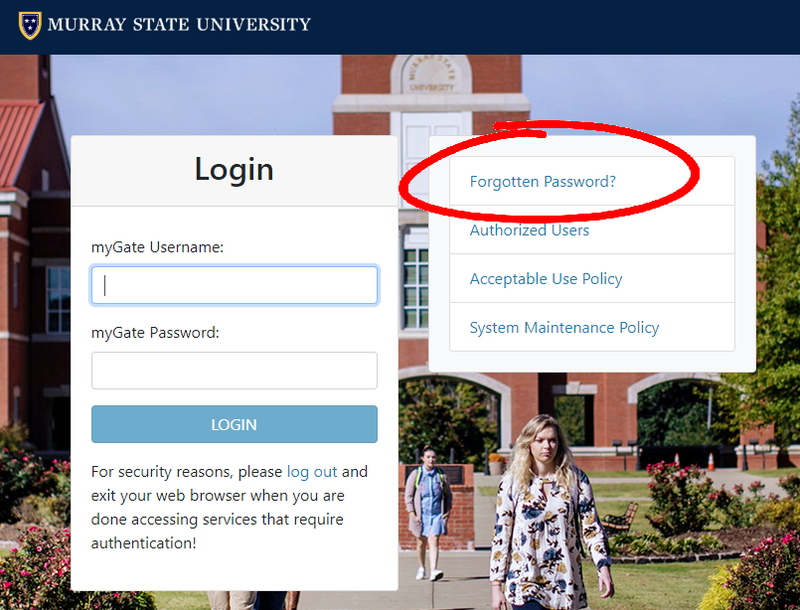 https://murraystate.teamdynamix.com/TDClient/KB/ArticleDet?ID=22550 Password Help / Self-Help Password Recovery System Password Help is the password recovery system that will allow a user to reset their myGate or Network (MSUNET2K) password without having to call the Service Desk.